Many people dream of owning their own business or making it to the top of the corporate ladder. In the pages of this book, you’ll meet African Americans who overcame obstacles and stereotypes to make their dreams a reality. Madam C. J. Walker was orphaned at age 7, married at 14, became a mother at 18, and was widowed at 20. She went on make a million dollars selling hair care products. Berry Gordy loved music but went broke after opening a record store. He didn’t give up, though. Gordy eventually started Motown Records, which became one of the country’s most successful record labels and introduced a host of talented black artists to mainstream American audiences. Stanley O’Neal grew up on a farm without running water or indoor toilets. Through intelligence and hard work he became the head of a $50 billion investment bank. Read about these and other inspiring figures in this book. 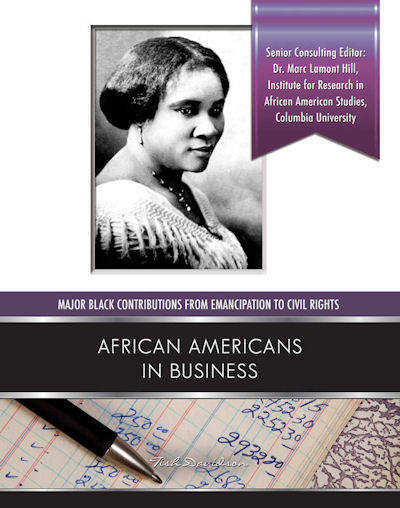 This entry was posted in Books and tagged african americans, berry gordy, business, madam c.j. walker. Bookmark the permalink.